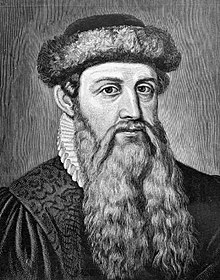 Johannes Gensfleisch zur Laden zum Gutenberg (circa 1398 – 3 Februar, 1468), a German metal-warker an inventor that's weel-kent for his contreibutions ti the technology o prentin in the 1450s, sic as a type metal alloy an ile-based inks, a mould for castin type accurate, an a new kind o prentin press foondit on presses uised in wine-makkin. Tradeition credits him wi inventin muivable type in Europe, a betterment o the block prentin uised there afore. By jyning thir elements intil a production seistem, he stairtit the swith prentin o written materials an an information explosion in Renaissance Europe. There's monie statues o Gutenberg in Germany, ane o the mair kenspeckle bein a wark bi Thorvaldsen, in Mainz, that is hame tae the Gutenberg Museum forby. The Gutenberg Galaxy an Project Gutenberg commemorates Gutenberg's name. Wikimedia Commons haes media relatit tae Johannes Gutenberg. This page wis last eeditit on 15 Apryle 2016, at 05:10.